. Published on October 4, 2018 . Tuesday, September 3, 2018: commence heavy breathing and heart-race. Now, if you’re like me, you may have been constantly googling phrase like “What will I learn from an MFA?” without any useful search results that go beyond from what you may have already heard through word of mouth. 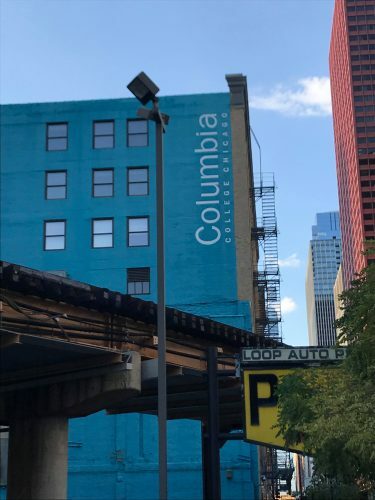 While I expected graduate school to have a workload that is significantly larger–and much more intense–than my undergraduate studies, I learned that there is no real way to grasp it until you experience it first-hand. 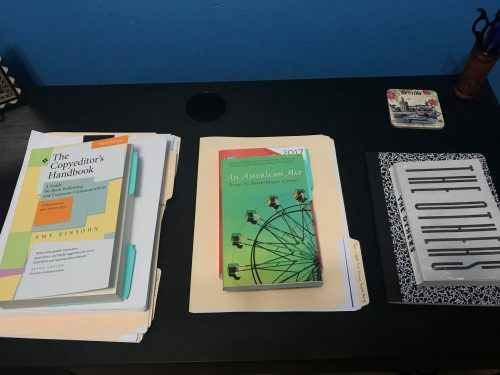 By the end of my first week, my initial instinct was to panic–I felt extremely overwhelmed and I began to wonder how I would manage being a full-time student with a full-time job–all while being the Poetry MFA’s graduate student ambassador. I’m not going to lie: it took a day (or two) for me to gather my bearings, and that’s when I realized that for the first time in my life I would need a personal calendar that is not on a screen. Lucky for me, my mom had a dry-erase calendar that was hardly ever used. Learning how to use a calendar is probably the most essential skill I’ve acquired after a month of graduate school. Once I got the calendar to hang off the wall in my room, it didn’t take me long to get obsessed with it. I also learned something about myself, that I’m an extremely color-coordinator kind of person: the green marker would be used to label my everyday (monotonous) routine such as school and work; the blue marker would be reserved for specific events, such as marking the days in which a class would meet earlier than usual, or the days where I promised someone that I would be somewhere; the red marker would be reserved for crossing off the days as they passed, which consequently gave me the biggest feeling of relief. 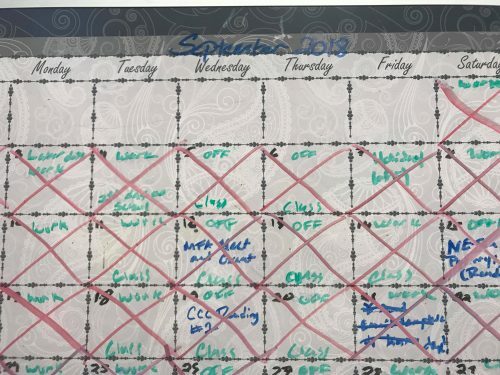 Once I had the month of September labeled out, I could feel a lot of the pressure that I felt from the conclusion of week one lift off my shoulders. It felt like I hit an “adulting” milestone. After a month of classes though, I will say that one thing I did read during my google search days about what to expect from an MFA program did bear fruit: that one will discover authors who are relevant and contemporary. I learned this through the first reading assignment for Professor Tony Trigilio’s poetry workshop, which was to read Matthew Rohrer’s The Others (2017)–an epic that follows a man from the beginning of a random day to its end, all while interrupting the read and unloading them with other narratives in between, like fighting Robot Bigfoots. I read The Others within a span of one day and was over the moon with it. The only thing that the internet links didn’t tell was that there may be times when these authors you discover might appear on campus to give a reading. Lindsay Hunter and Matthew Rohrer read at Stage Two as part of department’s Creative Writing Reading Series. While the reading by both writers was magnificent, the icing on the cake was when Professor Tony Trigilio invited Rohrer to do a Q&A in lieu of our workshop time that proceeded the reading, where Rohrer answered all questions thrown at him by members of my cohort—from his life after completing the MFA to the revelation (and his realization) of how boring his techniques for poetry inspiration are. 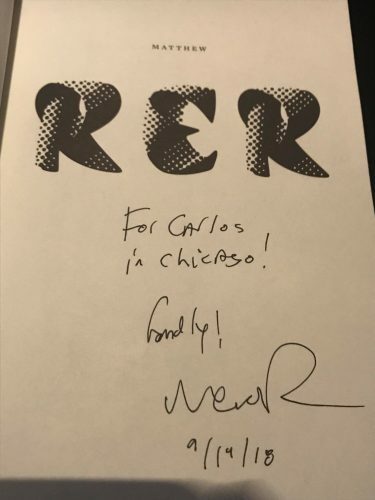 Matthew Rohrer’s signature, now forever stored in my bookshelf. While it is still too early for me to make any definitive judgements about graduate school, MFA Poetry programs, and my place in these spaces, these are the two big conclusions that I’ve drawn after a month in my program: (1) In order to manage the stress and workload of graduate school, one must elevate their level of “adulting” and (2) Poetry MFA programs can also provide a space for literary magic to happen in ways that might be difficult to obtain elsewhere.